We are your motorization specialists in Northern California and can seamlessly integrate any type of window treatment with other sophisticated whole-Home Automation systems such as Lutron HomeWorks, Control 4, Crestron, Vantage, MechoShade Net based systems as well as “App” based DIY systems such as Amazon Alexa, Apple Home Kit, Nest, IFTT, and more. We are Recognized Experts in Window Treatment Motorization & Integration Throughout Northern California. What are the Benefits of Motorization? Reduce mechanical challenges such as worn controls. Cover and easily manage window coverings in hard to reach and irregularly shaped openings such as skylights. Improve energy efficiency of your window treatments. Increase reliability with motorized systems that often perform better and longer than mechanical devices. With the Hunter Douglas PowerView® Motorization system, you can program your blinds and shades to open, close, tilt and traverse throughout the day…even when you are away from home! You can use a PowerView® Pebble® remote, smartphone or tablet to program the window treatments. Let the experts at Blinds & Designs demonstrate how fast and easy it is to program your blinds and shades using the PowerView Pebble remote or with the PowerView App. Programming your window coverings can even give the appearance of being at home while you’re out of town. If you have young children or pets, you may want to consider motorization. 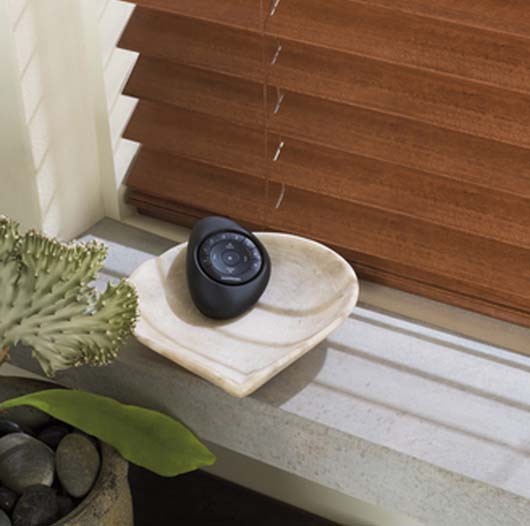 Motorized blinds and shades are cordless, which eliminates dangling cords. Our design team will explain all of the products available with this system. Most PowerView motorized window coverings are battery-operated, which makes them easy to install, maintain and operate. The battery pack is hidden behind the headrail, so nothing clutters your window coverings. Contact us for more details and a free consultation today!